Last week, I attend the first annual Cookbook Conference in nyc. If you are interested, you can watch all the recorded sessions for free in a few weeks on the website. The highlight of the conference was catching up with my mentor and a dear friend from college. 1. Italian Wedding Soup is a mistranslation: It means “wedded” soup, referring to the harmonious blend of flavors. 2. Cookbooks are and can be published by university presses! 3. A lot of people are willing to pay top dollar to attend a conference about cookbooks and food writing. I would have rather had the conference fee reduced rather than receive these to be quite honest. 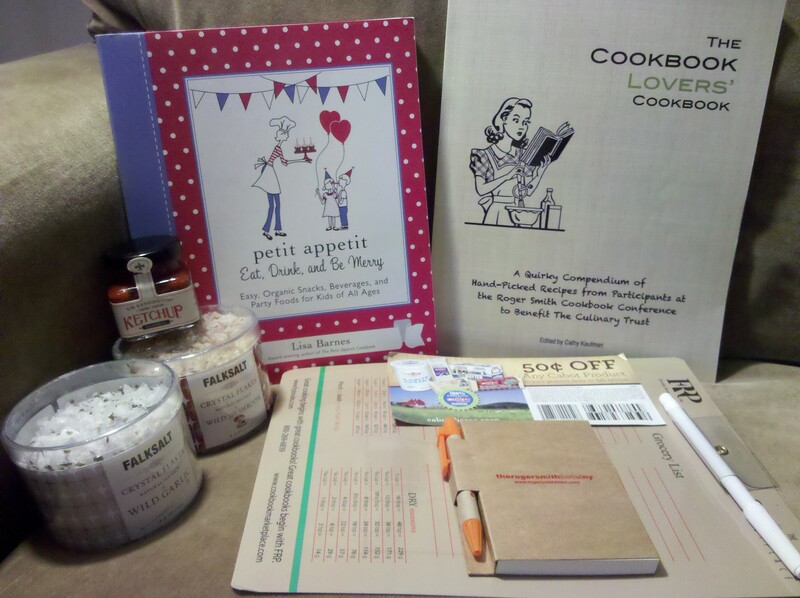 The cookbook on the right contains recipes from panelists from the conference. Do you think someone will make a movie about me if I cook every recipe in this book and blog about it?! These types of questions irk me, especially if they concern food. I mean, come on, is it really feasible to love one food THAT much to want to eat it just like how Kanye would say: Forever, ever? Ever, ever? But on occasion I feel like I can have certain foods forever and not get tired of them. Case in point: Murray’s Bagels! My sister first took me there, back in 2003. Since then I’ve been an avid consumer. When people tell me they know of another bagel store that is better, I tell them to go try Murray’s first before they claim that again. I’m that loyal. There are two locations in nyc: 13th and 6th and 23rd and 8th. They claim they are the same establishment but I’ll share an insider’s tip: The one in the village (13th st. and 6th ave.) is the real deal. Their bagels are dense, slightly chewy in the inside and firm on the outside. They make fresh batches throughout the day so employees actually glare at you and snap: “We don’t do that! Our bagels are fresh!” when you ask them to toast the bagel. I’ve seen this happen on multiple occasions and it’s amazing how each time the customer looks sooooo ashamed. 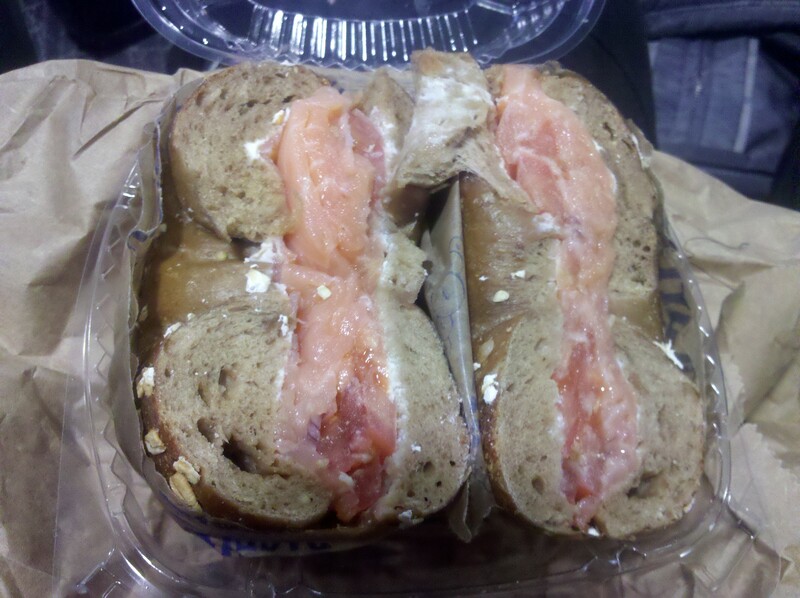 I absolutely love the multi-grain bagel with a bit of cream cheese, glistening smoked salmon, slivers of red onion,and two slices of tomato. I recently discovered the “sarcast-sol”, which adds a layer of whitefish salad to the aforementioned dressings. 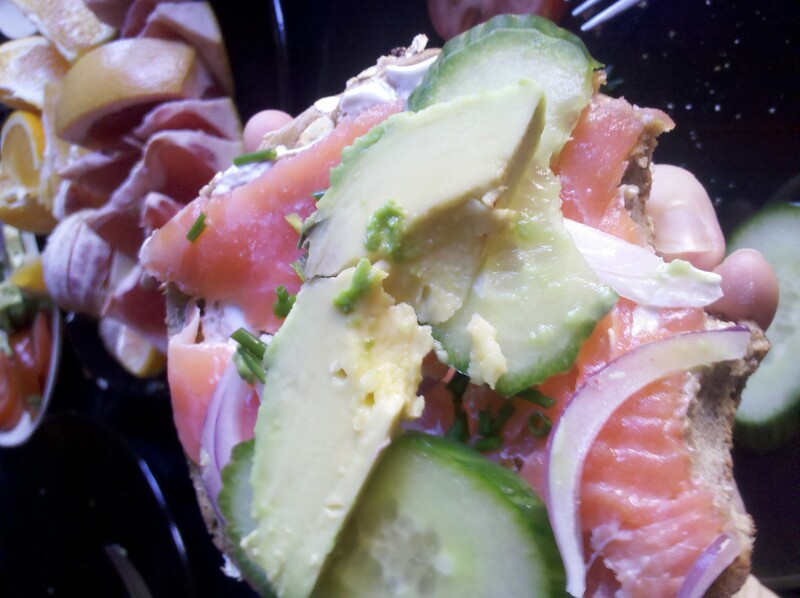 These bagels are SO good that I went twice during my 60 hour visit to nyc. On Saturday, I went to pick up 6 bagels for breakfast the next morning. They were slightly stale but 10 mins in the oven and they were revived! I ate this at the gate. Do you think people around me were jealous? Maybe they were just giving me the evil eye because it smelled so fishy. Once I arrived back to Bloomington, I proceeded to give out 5 bagels and then 6 more for dinner. Then I was left with 4. I consumed 3 bagels in the next 24 hours. Every time I thought I couldn’t eat another, I looked into the freezer and regained strength. 1 multi-grain bagel remained. I left it alone for a day and then decided to treat myself to get through Bruno Latour’s “We have never been modern.” I popped it into the toaster and returned to the book. I was fully engrossed until I was jerked back into reality as the fire alarm went off. The toaster had malfunctioned and completely burnt my last bagel. I was devastated but quickly came to terms of my last bagel’s unfortunate death. 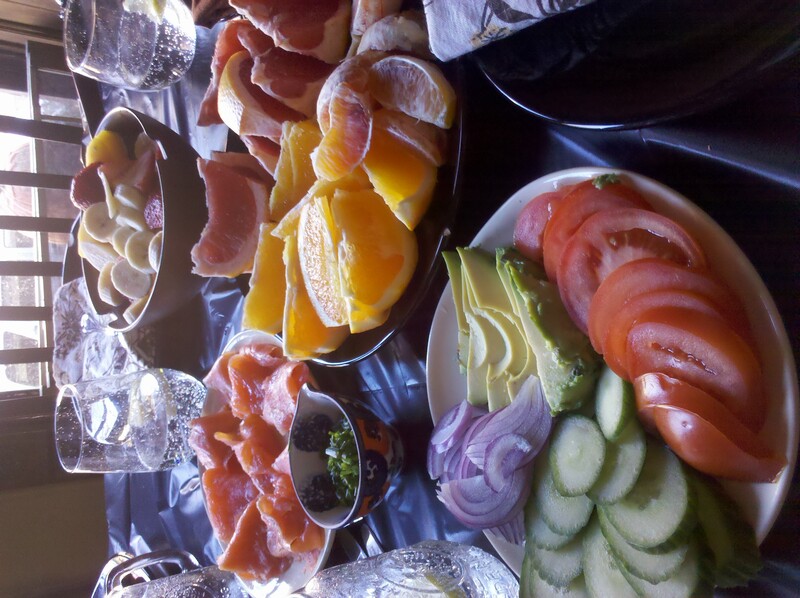 I was suddenly free from the bagels and now could eat other things! But I am still counting down the days when I will get to eat another Murray’s bagel. So what do you think you could eat forever without getting sick and tired of it? I just left it at that and proceeded to make plans for my weekend eating adventures. On Friday, on the bus to the airport, I saw that the Chef and owner, Hooni Kim, had responded to my tweet a few hours after I had tweeted. (I’m new to twitter so I’m learning how it all works still!) He said that he had been on the phone with a reporter from Seoul so couldn’t pick up the phone but that I should call again. I couldn’t believe it! I didn’t realize that anyone would pay attention to any of my tweets. I tried asking a couple of friends in town if they wanted to go with me on Saturday night but all of them had plans or were already out of town. So I decided to just go by myself. I met my editor from Hyphen Magazine (we are working on an article on kimchi, which will be published early next year) in Dumbo. When I told her my plans for dinner, she was immediately on board. She quickly invited her friend who started up Toki Underground in D.C. and I got in touch with Kheedim Oh (Mama O’s Kimchi) to see if he wanted to try the restaurant as well. It was very short notice but everyone said YES! We ordered dishes from both the traditional and modern sides of the menu. Traditional: Scallion and Korean pepper pancake, japchae, boodae jjigae (DMZ stew), and the trio of kimchi. Modern: Tofu with ginger scallion dressing, crispy calamari, spicy Korean fire chicken wings, bulgogi sliders, spicy pork belly sliders, and kimchi, bacon, chorizo “paella” with a fried egg on top. At first we ordered about 5 dishes but was encouraged to order 3-4 dishes per person. We looked around and saw that some of the portions looked quite big so we settled with 10. The side order of kimchi took awhile to arrive and we all kept on exclaiming: “this would be so much better with kimchi!” When the kimchi arrived almost at the end of our meal we devoured it! We also received a plate of the Bossam (braised pork, scallion, dehydrated daikon kimchi cabbage wrap) from the Chef, which was delicious! My favorite part was the dehydrated daikon kimchi. It was crunchy and slightly tangy. Verdict: The overall meal was great. However, as N observed “where are the vegetables?” I liked her idea of a a side of 4 different types of banchan that could be ordered to balance out the rich flavors. But what was more important than the food was the structure of the meal. Sharing Korean tapas was ideal for our group because it quickly made us bond over the food. -Kheedim portioned out the DMZ stew for each of us, ladling out perfect ratios of soup and noodles. -Our conversations seamlessly interweaved our impressions and thoughts about the dish, revealing our personal preferences and characteristics. After the meal, we all dispersed into the cold and slushy night with a jar of Mama O’s kimchi. If you want to make new connections and new friends be sure to try Korean tapas! Do you like artisanal kimchi? Then you would like Mama O’s. 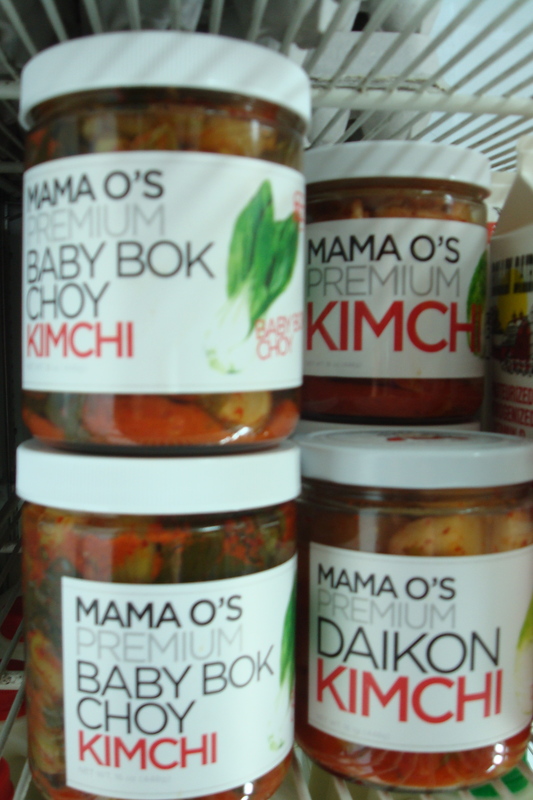 I’ve been following Mama O’s Kimchi brand for the past year. It’s made by Kheedim Oh, a kimchimonger by day, DJ by night. You can usually catch him at Lucky Strike (Not the bowling alley) in soho on the weekends. He told me that he attended the NYC Food Manufacturers Business Expo earlier in the week. Bloomberg gave a shout out to Mama O’s Kimchi as an example of a local business that is defining what NYC is best known for. Kheedim produced this short clip where Bloomberg raps about Mama O’s! Inspired to get a jar? You can find it at Murray’s Cheese, Essex Market, and Marlow and Daughters.